Red Sox shirts in Japanese. Tour guides who speak the language. Sushi materializing on menus around town. He has yet to throw a single pitch in a regular-season game for the Red Sox, but new Japanese hurler Daisuke Matsuzaka already owns a piece of Boston -- namely, that substantial slice represented by the tourism industry, which clearly views Dice-K as the true ace of the team, with all due respect to Curt Schilling and Josh Beckett . "From the day he signed, it's been like a pilgrimage to Yawkey Way," said Pat Moscaritolo, president of the Greater Boston Convention & Visitors Bureau. "As a lifelong Bostonian, I can't think of anyone who has captured so much interest and produced so much benefit to the broader economy." Potentially speaking, of course. But if Matsuzaka lives up to his billing on and off the field, Red Sox Nation could truly go global, with a major surge in visitors from Japan. If so, Boston businesses such as Old Town Trolley will be ready. Shawn Ford, vice president of the tour service, plans to hire and train Japanese-speaking guides in the next few weeks for a charter tour to be offered to visitors from Japan. "The phenomenon of Dice-K, it's just really unbelievable that it's got this much attention, this much hoopla, at this point," Ford says. "I've never seen anything like it before." But he knows a business opportunity when he sees one. So he has also applied for a permit to change the route of the tour so that it winds past Fenway Park. "With what the new owners have done over there, and now with the hoopla over Dice-K, it made perfect sense to give the people what they want and go down there," says Ford. And what else do the people want, according to those in the business of anticipating such things? The answer appears to be: just about any item or amenity that can be linked, however loosely, to the man from Japan. 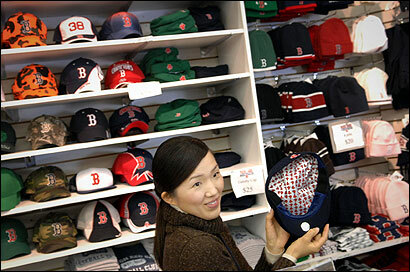 Near Fenway Park sits the Red Sox souvenir shop, which has experienced such a run on Dice-K-inspired merchandise -- including hats with his name and number on them and T-shirts that say "Red Sox" in Japanese -- that store officials may set aside part of the space for Matsuzaka-themed products. As soon as the Sox signed Matsuzaka in December, the store hired an employee who speaks Japanese, and it is looking for more, says Maggie Bartlett, the store's marketing manager. "Right now we're noticing that between 30 and 70 percent of our [business] is Asian tourism," Bartlett marvels. "He brought an entire almost untouched fan base for us. We didn't have a dense Asian fan base before." Nor have preexisting Sox fans around New England proven immune to Dice-K fever. "I remember when Schilling and [Keith] Foulke got signed, people wanted Schilling and Foulke shirts for Christmas, but it was nothing near the demand I got for Matsuzaka before Christmas," says Bartlett. "That was crazy." The souvenir store has also put UPS on alert that it may need to ship vast quantities of Matsuzaka merchandise to Japan as the baseball season gets underway. The avidity for all things Dice-K has not gone unnoticed by the city's hoteliers, transportation companies, restaurateurs, and retailers. They are hoping to benefit from the 10,000 additional Japanese tourists the visitors bureau expects Matsuzaka to draw to Boston this year, on top of the 30,000 to 35,000 who traditionally visit the city. Moscaritolo estimates that the Matsuzaka effect will pump $14 million into the local economy. Those numbers are lower than the estimates put forward by a marketing group in December. Moscaritolo said the visitors bureau's estimates are based on research that included numerous conversations with Japanese tour operators and with tourism officials in New York City and Seattle, where Japanese outfielders Hideki Matsui and Ichiro Suzuki play. The numbers would be higher, Moscaritolo says, if nonstop airline service were available between Tokyo and Boston. Still, says Moscaritolo, "When you think of $14 million to the visitor economy due to one person, that's pretty remarkable." Where will that $14 million be spent? Well, the Ritz-Carlton Boston Common has introduced a concoction called the Dice-K-Tini in its Jer-Ne Restaurant & Bar. The drink consists of 3 parts vodka, 1 part sake, and 1 part "passion fruit puree," in which bobs an ice cube in the form of frozen red dice. "We thought this would be a fun way of welcoming Dice-K to the city," says Barbara Lootz, the hotel's director of sales and marketing. Lootz said this is the first time the hotel has named a drink after a celebrity. The Palm Restaurant recently translated its menus into Japanese for the convenience of Japanese tourists and is looking into teaching staff members some basics of the language, according to Claude Lochet, the restaurant's assistant general manager. "Simple terms: rare, medium, well-done," he says. "Beer, steak, lobster." The way Lochet figures it, The Palm will benefit from the huge Japanese media contingent that will soon move north after chronicling Matsuzaka's every move in spring training in Florida. "Once they get up here, they're going to be hungry, and they're going to be twiddling their thumbs for four days" between Dice-K's starts, he notes. Lochet reports that a customer toted four bulging bags into the restaurant recently. "There must have been 120 T-shirts in there, all Dice-K," he says. At the Fairmont Copley Plaza, sushi has been added to the rotation of hors d'oeuvres served in the Fairmont Gold Lounge, its club floor, and the Japanese beer Asahi will be available in the Oak Bar. Desk clerks have expressed interest in learning Japanese, and Japanese tour operators have contacted the Fairmont Copley Plaza about accommodations for groups. "There's lots of excitement, and high hopes," says Suzanne Wenz, spokeswoman for the hotel. You don't have to look far to see signs -- literally -- that Dice-K Fever Grips Hub . On the southbound side of the Southeast Expressway, a billboard proclaims: "Welcome to Boston, Daisuke Matsuzaka!" The home page of the website run by the visitors bureau offers this message in Japanese and English: "Pitcher Daisuke Matsuzaka Boston Welcomes You." And all this before the bobblehead doll gets here. Bartlett expects the Matsuzaka bobblehead to arrive at the souvenir store any day now. "That will be big," she says.